Newcastle United have the dubious benefit of an extra day off before their next Premier League fixture. No doubt Rafa Benitez would have far preferred to have an extra day before Brighton to prepare his team, rather than the thankless task of taking on Manchester City. There are eight Premier League fixtures today (Palace are home to Arsenal on Thursday night), so what should Newcastle fans be hoping/fearing today? The good news is that thanks to Saturday’s win, Newcastle can’t drop into the relegation zone even if all the results go badly for Rafa’s team today. If either Bournemouth or West Ham win their clash today, they would go above Newcastle, but neither West Brom or Swansea can, even if they win. With Palace not playing until Thursday, if the Bournemouth v West Ham game is a draw, then Newcastle would be guaranteed to be still 15th going into the Man City match. It is obvious that Newcastle fans should be looking for West Brom to lose at home to Everton, Watford lose to Leicester, Liverpool to win at Anfield against Swansea, Brighton to lose at Chelsea, plus Spurs to beat Southampton in today’s early kick-off. 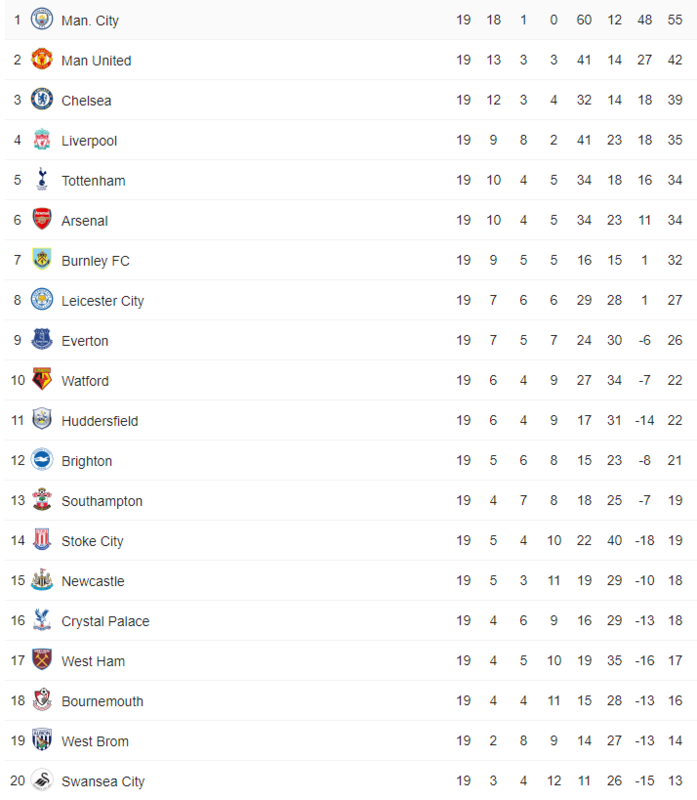 I think draws in both the Bournemouth v West Ham and Huddersfield v Stoke matches would be the best outcomes (a point going missing etc etc), so this is how the bottom half of the Premier League would look like with those results – everybody then having played 20 games apart from Newcastle and Palace with 19 played before their midweek fixtures. That scenario above would see Newcastle potentially going as high as 12th with a win over Manchester City. I think the reality is that Newcastle’s best and most direct route to safety is if, as well as the Magpies obviously winning matches, if West Brom and Swansea could get increasingly cut off at the bottom, with at least one other joining that pair with a dismal run (such as the one Newcastle have at least temporarily climbed out of with the victory at West Ham).